"I was getting a little lazy at home, and I decided I'd go down to the exercise club." - 102-year-old Ray Clark on why he started exercising at age 98. Jerry Schumacher runs 4:43 mile in warm up!! LRC Janet Bawcom And Jason Hartmann Both American Stars, Both Pondering Their Future In The Sport Janet contemplates becoming a full-time nurse despite being an Olympian and Jason still is without a sponsor after finishing 4th at Boston last year. Sunday's Seoul Marathon Is Offering $500,000 For Men's World Record, $200,000 For 2:03 And $80,000 For Sub-2:10 Win Duncan Kibet (2:04:27) and Eliud Kiptanui (2:05:39) are among the favorites. For the women, sub-2:24 is $80,000 and sub-2:19 is $100,000. 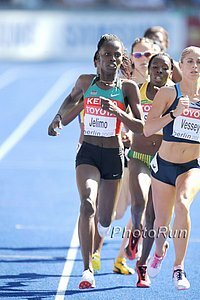 Friday: Former 800 World Jr. Silver Medallist Winny Chebet Shines On Day 1 Of National Bank Of Kenya/Athletics Kenya Track Meet Chebet, who was 2nd at the Kenyan Olympic trials but dropped from the team as she didn't have the "A" standard, did run 1:59.37 last Sept.
Non-Jamaican Delano Williams Is Favorite For Much-Anticipated Boys 100-Meter Final Williams, the world junior 200 champ who has PRs of 20.47 and 10.32, slipped in his blocks but still qualified for the final. He is the Turks & Caicos national record holder. Jamaica's 16-Year-Old 800 Standout Tiffany James Isn't Running 800 This Year - Just 200 Last year, she won the 400 and 800. US HS News: Cameron Burrell - Son Of Former WR Holder Leroy - Will Run For His Dad At Houston 10.46 is his PR. Australian HS News: Australia's 16-Year-Old Georgia Wassall, Who Has Run 2:04.68, May Not Be Allowed To Double At World Youths As She Has Only Hit 1,500 "A" Time Once The 16-year-old should be allowed to run whatever she pleases. Today: Olympic 800 Silver Medalist Pamela Jelimo & Bronze Medalist Timothy Kitum Both Racing The 400 At National Bank Of Kenya/AK Track Meet This meet will select Kenya's teams for Penn Relays. Other Upcoming: Reigning World XC Champ Imane Merga Says He's Fit Ready To Defend His Title Next Weekend Despite Dropping Out Of The Ethiopian Trials Of his DNF he said, "There is no need to worry. I had been training really hard in February and even did a tough session the day before the race. I just felt tired." Edwin Moses On US Olympic Bid: "If it is going to be in the United States again soon, it is going to need some serious thought and it is going to need a serious bid." 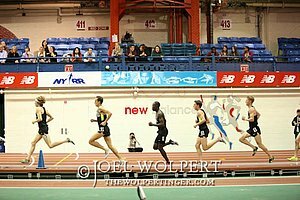 LRC WTW: Mary Cain Vs. D'Agostino, Lawi Lalang's Double Vs. Galen Rupp's Triple, Eric Jenkins, And The Greatest High School Finish Ever? Abbey D'Agostino and Lawi Lalang stole the show at NCAAs, but Jordan Hasay ended her NCAA indoor career with an impressive feat. Plus, Eric Jenkins turned a few heads and we have a must, must watch video from the NBIN if you have 90 seconds to spare. 17 More Athletes Caught And Facing Doping Bans Due To Blood Abnormalities Detected With IAAF's Biological Passport The athletes are at this point unnamed. *MB: 17 POSITIVE TESTS!!. (not released by the IAAF yet) Make your bets here! IAAF Sets Up Temporary Blood Testing Facility In Kenya The reason blood testing hasn't been done in Kenya in the past is because the remote training locations made it hard or impossible to get samples to an accredited laboratory within the required 36-hour time frame. WADA Says They Will Take Extra Donation From Russia With "No Strings Attached" WADA's Director said that "One of the conditions we have with any funds that we are given by any organisation is that it's not tied to anything." May 5th: TUI Marathon Hannover Features A Duel Between Defending Champ Joseph Kiptum And 2011 Winner Lusapho April The field also includes 2:07 man Wilfred Kigen. 2:26 woman Julia Muraga leads the women's field. Summer: Pre Classic HJ Will Include All The Olympic Medalists From London It will be led by champ Ivan Ukhov and also include silver winner Erik Kynard and bronze medalists Derek Drouin, Moutaz Essa Barshim and Robbie Grabarz and 2011 World Champ Jesse Williams. Lithuania's 2000 & 2004 Olympic Discus Champ Virgilijus Alekna Still Going Strong At 41 Years Old He'll compete in this weekend's European Cup Winter Throwing meet in Spain. GB 10k Runner Chris Thompson Says He Will Probably Follow Mo Farah Up To The Half Marathon And Marathon On The Roads Eventually But for 2013 he'll still be focused on Moscow 2013 and the track. Jessica Ennis Says She'd Like To Break The 7,000 Point Barrier In The Heptathlon, But Is Not "Obsessed With It" She has the British record at 6,955 points. Only 3 women have ever broken the 7,000 barrier, with the WR set at 7,291 by US's Jackie Joyner-Kersee back in 1988. *Video Of Usain Bolt's Hologram Accepting The Award Not sure why, but Bolt coudln't make it, so his Hologram accepted for him. Maria Mutola Says Caster Semenya's Training "is good." Guy Who Beat Oscar P In 200 At Paralympics is "very sorry for what happpened." UK Runner - Runners Were Way Faster 30 Years Ago - Is It Because Of Their Old-School Training? He's Gonna Find Out The 30 minute 10ker is going to do the same training his coach did in the early 1980s. Follow his quest as he chronicles it on this blog: Acceptable in the 80s. Are All Women Runners At Risk For Iron Deficiency? A Small Study Suggests So We'd go farther and say all runners - including males - are at risk. Typical NCAA Red Tape: Sami Spenner, The 2nd Highest Scoring Pentathlete This Year, Wasn't Allowed To Compete At NCAAs Due To Her School Undergoing Reclassification Nebraska/Omaha coach, Steve Smith: "The NCAA can call it what they want and they can give reasons for what they want, [but] there are no logical reasons. ... The only thing it does is hurt a team or an athlete." Man With Brain Cancer Wins Marathon In 3:07 While Pushing His Daughter In A Stroller Iram Leon: "This is supposed to eat away at my memory in the end. But I hope this memory is one of the last things to go and one [my daughter] never loses." Woman Finishes Marathon After Breaking Ankle Only 3 Kilometers In She finished last in 9 hours. World Junior XC Champ Mercy Cherono And 2011 Bronze Medalist Vincent Chepkok Dropped From Kenya's World XC Teams 2010 champ Emily Chebet now leads the women's team. World XC Champs Runners Should Be Ready For Harsh Winter Weather In Poland Later This Month The Polish Trials were this past weekend in snowy, cold and windy conditions. UK Junior XC Runner Emelia Gorecka: "I want to challenge the Africans and whoever is up there because that's the point of World Cross - to compete against the best in the world." MB: Something to ponder, Mary Cain beat Emma Coburn (NCAA mile champ) and Abbey D'Agostino (NCAA 3k/5k) prior to 2013 NCAAs What event(s) might Cain have won at NCAAs? *Mary Cain Feature In Her Local Paper Not only is she incredible at running, she has a 4.2 GPA. How Well Do You Know Your Mile Trivia? Bring Back The Mile Guide's State Mile Guide For Pennsylvania Every great stat associated with PA milers. Did you know Dennis Fikes, the first African American sub-4, first went sub-4 at 3:55.0 in 1974? Bring Back The Mile Guide's State Mile Guide For Delaware Did you know that zero people have ever broken 4 in Delaware? Washington Post Feature On 102-Year-Old Guy Who Started Exercising At Age 98 "I was getting a little lazy at home, and I decided I'd go down to the exercise club," he recalled. They built them tougher in those days. He doesn't say he can't do it until he tries and sees he can't. Britain's 2-Time Olympic Gold Medallist In Cycling, Victoria Pendleton, Once Got Tendinitis From Running 200 Meters In A Parking Lot She's now up to 8km, however, in her retirement. Holly Bleasdale Confident New Coach Dan Pfaff Will Take Her To 5.0 Meters Eventually "Dan said ,'I don't expect you to be jumping as high as you were last year because we need to take a step back to move forward in the future. Change your technique and that will make you jump five metres down the line.'" Jenn Suhr Diary From Florida Where She Went To Disney World Joe Flacco gets paid to go, it looks like Jenn Suhr paid for her own ticket. RR: RW Looks At Drug Testing At Road Races And Finds Many Prize Money Races Don't Have It Because It's Too Expensive Or Because They're Too Naive To Know They Need It After the 2012 Carlsbad Marathon winner was caught using EPO, the vice president of the race management company ridiculously said, "If it happened again, we might look at the possibility [of adding testing], but it's hard to image that people are actually doing it." German Journalist Hajo Seppelt Who Broke The Initial Story About Kenyan Doping Speaks At "Tackling Doping in Sport 2013 Anti-Doping Conference" "I am convinced that [Kenyans] have the same problem that a lot of other countries have ... it's not only a Kenyan problem, it is a problem of athletics." Reeva Steenkamp's Dad Says He Wants To Meet With Oscar Pistorius Face To Face He says he wants it "for closure." Ryan Gregson Happy With His Sydney Classic 1,500 Despite Just Missing The "A" Standard And Losing To Nick Willis He ran 3:35.25 just missing the 3:35.00 "A." Day 2 Boys Recap: Jamaica College Are The Early Leaders For The Team Title Defending champions Calabar High are in 2nd. Tirunesh Dibaba Withdraws From 2013 London Marathon With Shin Injury The marathon debut of the greatest women's distance runner in history is going to have to wait 365 days. LRC Ryan Hall And Moses Mosop Both Pull Out Of 2013 Boston Marathon Two of the biggest names have both pulled out and somehow John Hancock thought it was appropriate to title the press release "John Hancock Financial Announces 2013 Boston Marathon Online Media Guide Is Now Live." Boston has scrambled and added in 2013 Dubai winner Lelisa Desisa. *RW Q&A With Ryan Hall About Pulling Out Of The Boston Marathon And His Injury Status He says he's back running fine and the injury to his quad wasn't serious, but it was enough to keep him from doing "any substantial running" for a month and he missed too much time to be fit for Boston. *MB:Will Ryan Hall ever commit to and finish another marathon? Citing Tightness In His Calves, Meb Pulls Out Of This Weekend's NYC Half Meb said he recently had 2 great months of training and called this "one of the most difficult decisions in my career." Lali Lalang & Abbey D'Agostino Are D1 National Track Athletes Of The Year HJ champ Derek Drouin and LJ/TJ champ Andrea Geubelle were named Field Athletes Of The Year. For The First Time Since 2001, The Total Number Of US Marathon Finishers Declined From A Record 518,000 In 2011 To 487,000 In 2012 This was obviously due to the cancellation of the NYC Marathon, which would have added an additional 47,000 finishers. LA Marathon Will Be 60th Of Career For 77-Year-Old Who Runs Thinking Of His MS-Stricken Wife He cares for her full-time when not running. "My life is pretty simple. It's all about taking the next step ... just take the next step." UK World XC Team Announced 23-strong GB & NI team is announced for IAAF World Cross-Country Championships. 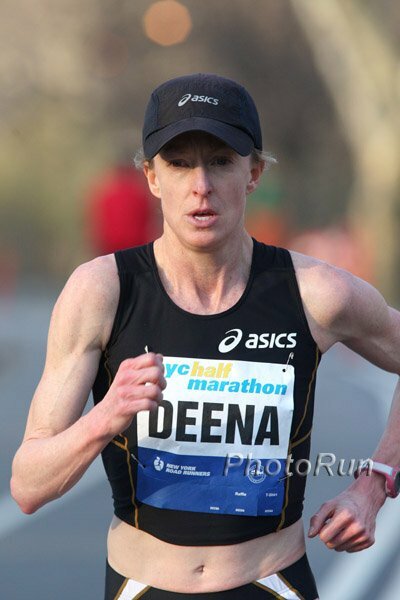 Good LA Times Article On Deena Kastor And Her Decision To Run The LA Marathon, Which She Says She's Aiming To Win Husband/coach Andrew Kastor: "She's not blessed with fast twitch muscles, she doesn't have a big kick, but she does have a ginormous VO2 max, that engine that feeds the body. Her strategy is usually to take it out hard then run scared." RW Q&A With Guor Marial On His Recent Dual US/South Sudan Dual Citizenship And His Thoughts Ahead Of The Boston Marathon He's also running the NYC Half this weekend. NYRR: 5 Things You Should Know About Stotan Racing Athlete Maegan Krifchin Ahead Of Sunday's NYC Half She's the only woman in the training group and qualified for the Olympic Trials last year with a half marathon time, but decided she wasn't ready for the full distance yet. Mo Farah Says He Misses UK Soccer Games But Enjoys Going Out To Stores Or Restaurants Without People Knowing Who He Is Salazar: "Without Galen Rupp, Mo Farah doesn't win two gold medals. 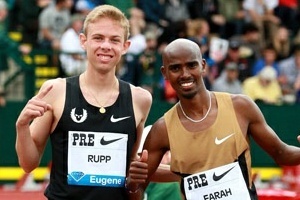 Without Mo Farah, Galen Rupp doesn't win a silver medal ... 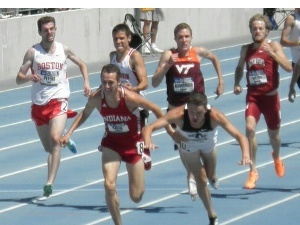 In distance running right now, there are probably not two partners who are that good anywhere." IAAF Galen Rupp Profile: "At some point I would like to know that I'm the best in the world." Oscar P's Family Say That He Is Not Suicidal However, they admitted that his "legal expenses are massive" and he's had to sell off some investments, including his racehorses. Alan Oliveira (Paralympian Who Beat Oscar P In The 200) Says "I do not consider Oscar an enemy." 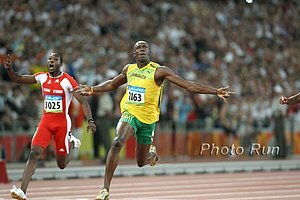 Interesting: Netherlands Sprinter Churandy Martina Is The Only Athlete To Appear In Each Of Usain Bolt's Four Individual Olympic Finals In Beijing & London He says that he thinks Bolt and Blake are "beatable." 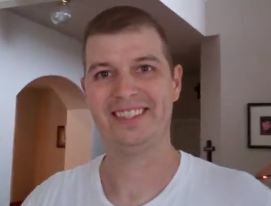 Friend: Oscar P Is "Broken" And "On Verge Of Suicide"